X-craft is dedicated to enhancing Emergency Services capability by offering the most powerful Unmanned Aerial Systems available. We are not armchair consultants, designers or developers and have worked in the field beside you to understand what you want. We all agree that solutions must be need based, anchored on real world experience, not driven by the manufacturing and retail market. X-craft have learnt from the experts, those who do these incredibly demanding missions, to indentify what is important and how we can add real value to conducting the hard tasks. No gimmicks, no toys, just simply better tools. Click here to check out an example of our on-going collaboration with New Zealand's LandSAR. 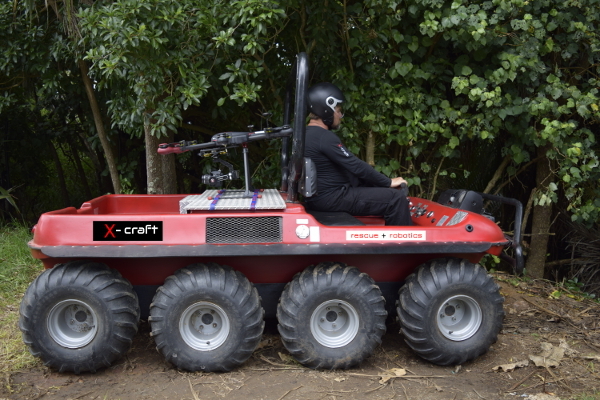 X-craft is proud to announce the development of a unique Special Emergency Event Rapid Response System (SEERRS). This offers robust tools applicable to all Emergency Events, from small localised rural fires to major environmental and humanitarian disasters. From its inception we have designed this system to incorporate operations in diverse, challenging environments. We recognise the differences between Search and Rescue conducted in the busy confines of cities to operations in remote mountains and valleys, missions on humid tropical islands to those in the icy south. We have taken our time, listened carefully to Emergency Services experience in the field, and invested heavily in developing this system. We are confident that it will meet your high expectations and deliver the results you need to help save lives. The Special Emergency Event Rapid Response System is being jointly developed under a partnership of world class companies and the project is known as rescue + robotics.